Today's Draw: The Life We Long Ago Chose from Illuminate! 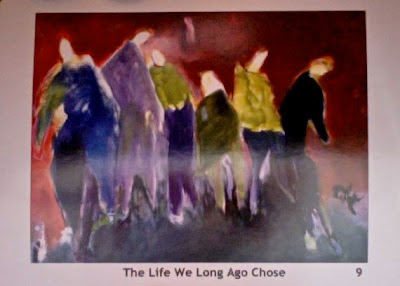 Life Journey Cards by Linda Clayton, Part 1. Is there a choice you made a while back that you thought you could honor, but now you've changed your mind? Do you think couples can or should promise forever, or is that part of marriage unrealistic? When it comes down to a choice, would you rather choose to honor a previous commitment or would you rather choose your future happiness? You might have noticed that I use this deck every few weeks. I'll tell you why. I'm a very verbal person and the phrases on the cards are very evocative for me. This card in particular made me think of a couple of "big things", so I'm doing this card in two parts. I'm not sure if I have a theme this week or not. We'll try for "Looking Back" week—things from our past, including past lives—and see what comes up. So the card depicts a group of people and the person on the far right seems to be falling away from the pack. This can happen with people and also with things and dreams and other stuff that once worked for us. For example, very few of the people I was friends with in my 30s are still in my life. I changed or they changed. Whatever happened, the life I long ago chose is no longer the life I choose. A bigger example of this is seen in my career as a performer. I know you're all thinking, "huh? A performer?" But if you knew me from, say, 12-22, that's how you'd know me. I was in all my school plays and musicals. I was in all the talent shows. And I studied voice and theater throughout college. Acting and singing were huge passions of mine. In fact, I wanted desperately to go to a performing arts school at one point and my parents wouldn't let me. By the time they came around to my way of thinking, however, I had seen the wisdom of their choice and decided to stay in the school I was in. While I was always a writer, back then I was writing for performance. In fact, I won a national award for a play I wrote in college. Up until just before my 22nd birthday, the whole advertising thing, while something I really enjoyed and earned my degree in, was merely a good fall back in case my acting career didn't pay off. It sounds so foreign to me just writing those words right now. By the time I did graduate from college, I was full-on advertising and have had that passion ever since. But back up to really my last semester of college, I was still entertaining thoughts of the footlights. The desire for that had been slowly slipping over time, but it was still there. So what happened? I've asked myself that a number of times. And while I can cite certain things that disillusioned me, the real reason is that the life I long ago chose was no longer the life I was choosing. It's as simple as that. Something that I thought was going to be my life, ended up being something I would set down and never revisit again. I never acted again after I left college. And I only sang in public once more after that...at my brother's wedding. Whether the life you long ago chose is with a man you now cannot stand, or whether it's your career, friends, or even sexuality that no longer fits, it's OK. We are both amazingly adaptable and changeable creatures. There are some things that will never change. I'll always be dramatic and expressive, I just won't give voice to those qualities in the same way. There's this thing in society that says once you've chosen a direction you need to stick with it. You've chosen this man, so you have to stay with him for better or for worse. You've chosen this career, so you have to work in it until you retire. But all of that is BS. We change. We grow. We change our minds. And to deny ourselves the room to change and grow and explore our constantly evolving selves, is like leaving a seedling in its little seedling pot. Either you give it the room it needs to grow, or it will just wither away and die. Is there something in your life that you once enthusiastically chose that you just can't tolerate any longer?